Home cooked food is undoubtedly the best food in the world but then there are days when one craves for a different taste at home only. Eating food from unknown places can prove to be irksome; hygiene among others is the prime concern which dissuades foodies from asking for home-delivery. Hygiene and taste, both at the same time is something one rarely finds at places other than certified restaurants and outlets. The certification that 5 star and 3 star restaurants etc. makes them novel. But getting 5 star and 3 star restaurants food is difficult if you don't live in the vicinity of one. It is here that FoodRool comes to rescue, it is the only mobile food delivery marketplace in India which has exclusive tie-up with 5 star Restaurants and delivers foods from them. 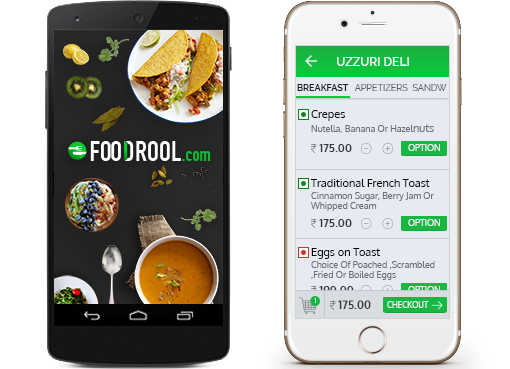 FoodRool is an online food order and delivery platform based out of New Delhi, which caters to the craving of anyone and everyone and assists in selecting from a range of gourmet meals from leading industry stalwarts. FooDrool is a Start up, which was started by Tanmay Garg a young man who is in his sophomore years. Start Ups have become a rage in the past few years and with PM Modi's recent launch of Start-up India, even teenagers are giving a vent to their entrepreneurial streak. FooDrool was launched recently and has already established tie-ups with most of the 5 star restaurants in Delhi-Gurgaon. Some of the prominent ones are Jaypee Sidhdhartha - Rajender Nagar, Piccadily - Janak Puri,Crown Plaza – Rohini, Radisson Blu – Mahipalpur, Vivanta by Taj - Khan Market. A food connoisseur can now treat his taste buds with the food items with the choicest range of delectable items cooked under the guidance of renowned chefs. "I am a die-hard foodie who loves to explore variety of meals from renowned hotels and premium restaurants. However, at times you wish to avoid driving and enjoy your favorite meal in the comfort of your house or office. But it wasn't feasible since most of the five star hotels and premium segment of restaurants do not deliver their food. As we all know that invention is a mother of necessity. Hence, FooDrool came into existence with a thought of delivering an epicurean delight at your doorstep so that you enjoy your favorite food irrespective of the bad weather conditions and heavy traffic jams on Delhi and Gurgaon roads," says Tanmay Garg, Founder, FooDrool. FooDrool provides food upto a radius of 12 kms unlike other food delivery marketplaces which are restricted to a distance of 5-7 kms. It is possible due to the huge fleet of delivery boys and their special carry-bags which can keep food warm for more than one and half-hours. It has been in operation since the past few months and is getting a better response with each passing day. As of now Crown Plaza located in Rohini attracts maximum orders. Tanmay further added, "We plan to expand FooDrool's operations to major metropolitan cities by year end. Though our goal is to focus on investing with its retained profits in the future but we will be open for investments from good investors for further expansion as our service model has huge potential and we hope to reach the breakeven in short time keeping operational costs minimal. Also, we are already in talks with 8 to 10 major hotels Delhi and Gurgaon and hoping the tie ups to be done by the end of this financial year. The idea behind FooDrool is to provide high quality and hygienic food from selected restaurants. FooDrool already has tie ups with 50 plus restaurants which are selected carefully by our in house on-boarding team. Hence, FooDrool is looking forward to tie up with more restaurants as we also want our customers to enjoy the variety of cuisines. Order wise FooDrool is growing approx. @ 30 % per month. However, the growth aspects cannot be predicted now as FooDrool is the only player in the food delivery service of 5 star hotels."